​Directions for both cottages: From Lochgilphead, proceed south along the main road (A83) and at the final roundabout, take the A816 to Oban. Continue along A816 for approximately 2 miles, until the road forks to the right and shows signs for Oban. Take the left hand turning into Cairnbaan... From Oban, take the A816 south for Lochgilphead. Continue for approximately 30 miles and pass through the village of Kilmartin. After about 5 miles the road forks to the left and shows signs for Lochgilphead, but there will be a sign for Cairnbaan to the right... 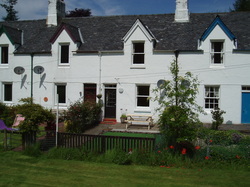 Turn right into Cairnbaan, Crinan Canal Cottages are on the north bank of the Crinan Canal. Stay on the right side of the canal as you pass the Cairnbaan Hotel - do not cross the bridge. ( i.) Go right and follow the track between the first row of white cottages, then a lane (which is rough with potholes) until you come to a greenhouse just before the beginning of the 2nd block of white houses. The car parking space for No8 is shown by the parking sign on the right hand side). (ii.) Or you can stay on the road (recommended) and turn first right after the second row of cottages - and before lifebuoy ring, and then drive down the lane until you reach no 8 unpack and then carry on down the lane to the allocated car park space . Continue for another half mile and the road forks. You can either go right and follow the track between the first row of white cottages and a lane (which is rough with potholes) until you come to the second row you and come to No 4 which which has a newly painted black porch to the rear, where you can unpack, or you can stay on the road (recommended ) and turn first right after the second row of cottages and before lifebuoy ring then double back to reach No 4. The parking area for No 4 is the large open area at the end of the row containing No. 4 where there is space for about 6/8 cars.